We are all to blame! Van Teijlingen, E., Simkhada, P. and Stephens, J., 2010. We are all to blame! Republica, 22 Apr. 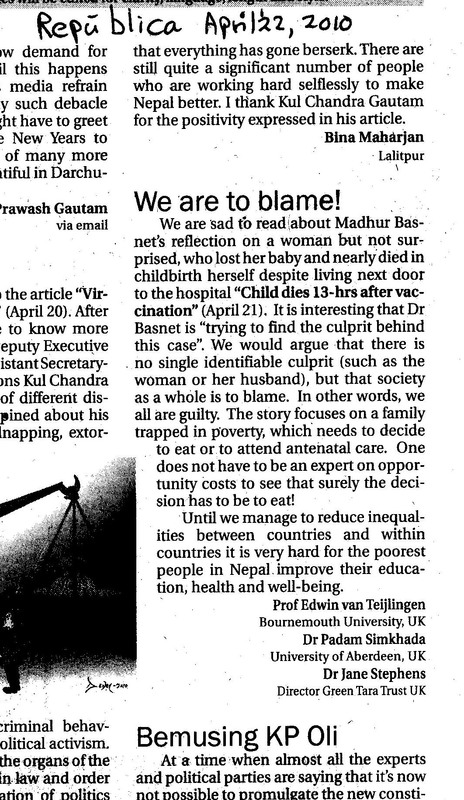 This letter to the editor is a reply to an article written by Dr. Madhur Basnet in the same newspaper Dr. Basnet reflected on a woman who lost her baby and nearly died in childbirth herself despite living next door to the hospital. It is interesting that Dr. Basnet is “trying to find the culprit behind this case.” We would argue that there is no single identifiable culprit (such as the woman or her husband), but that society as a whole is to blame. In other words, we all are guilty. 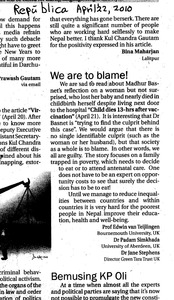 The story focuses on a family trapped in poverty, which needs to decide to eat or to attend antenatal care. One does not have to be an expert on opportunity costs to see that surely the decision has to be to eat! Until we manage to reduce inequalities between countries and within countries it is very hard for the poorest people in Nepal improve their education, health and well-being.